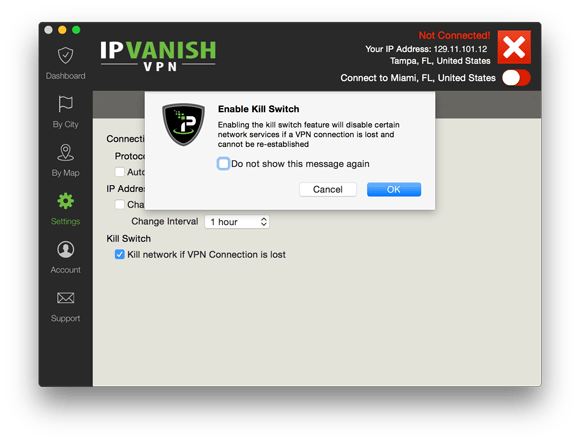 IPVanish one of the leading VPN service providers today released their new and improved VPN software for Mac systems. Mac computers are widely used but due to not being as widespread as Windows-based desktop or laptop systems they are often overlooked in terms of VPN solutions. While many providers offer Windows software and even apps for mobile devices Mac VPN software is often an afterthought. VPN software for Mac has been part of the suite of tools for the IPVanish service for quite some time but today IPVanish released a new and improved version which addresses many missing features of previous incarnations and will certainly be welcomed by those who wish to use a VPN on a Mac system. So what’s new in the Mac VPN software? IPVanish have worked hard creating a package that visually matches that of their Windows and other systems software which is great for those who are used to using their service on another system and takes away any learning curve for the beginner. Built in Kill switch – If connection the VPN server is lost it will automatically disable your internet to stop data leaks. Enhanced city selection – Allowing highly customised user server selection down to city level. Custom DNS settings – User defined DNS selection between IPVanish’s own or custom entry. With the release of the new improved custom Mac VPN software IPVanish have standardised their full suite of software aesthetically. Mac users are now able to access features that Windows users are regularly accustomed to which opens a wealth of opportunity for VPN use across Mac systems. IPVanish currently has over 170 server locations across the world and have a wide selection across Europe, North America, Central/South America, Asia, Africa and Oceania. They boast custom software for Windows, Mac, Android and iOS covering both iPhone and iPad. A full and detailed IPVanish review can be read in our reviews section.